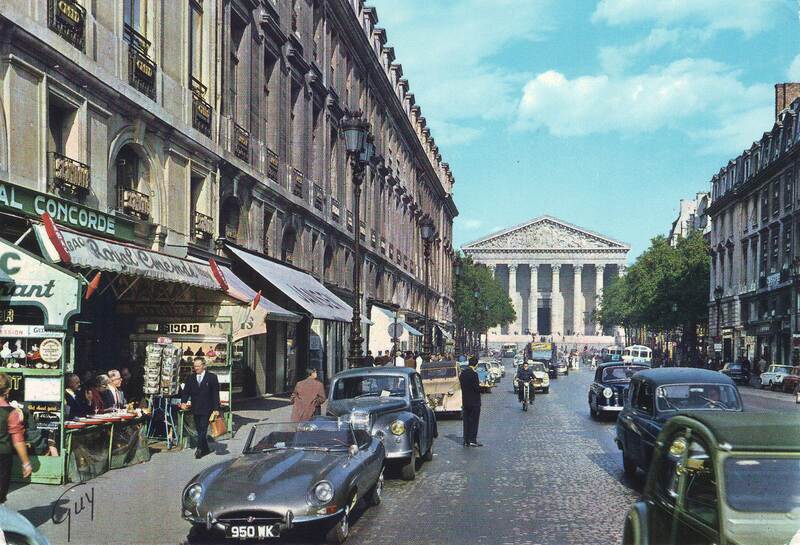 Jaguar E-type coupé, left-hand-drive and top down in Paris. (To see only postcards with Jaguars, click Jaguar in the tag cloud). Behind it is, I think, a Daimler Conquest, but that would be strange – to have these two British-made cars parked together. That blue car a few cars back confused me. I thought it was the rear of some big American job, but then I realised that it is the front of a Citroen DS and what confused me was the bottles on the tray that guy is carrying across the street. So yes, I think we do have two British cars amongst on a street full of French and German cars. Perhaps the embassy is close by? E-Type: left hand drive indeed, but with a British registration. I can’t see the steering wheel of the Daimler, but following English traditions, windscreen wipers on a Conquest rest in front of the driver. So: another lhd. Its yellow bulbed headlamps, like on the Simca behind the green 2CV and following French traditions, match perfectly with all this.